The first impression of your business is website design. Modern website design is a fascinating blend of art, digital technology and user experience. Keeping the pace with digital technology alone makes responsive website design – design that changes the layout of a page depending on the screen resolution – a critical business decision. What business requirements do you have? What kind of user experience do your customers expect when on your site? How does your brand identity, such as typography, translate online? How will a user interact to accomplish tasks, like making a purchase, or downloading an important piece of content? You’ve probably been on a website that looked great, but was hard to navigate, find what you need, was too slow, or was simply confusing. Like walking into a poorly designed home, a website with a poor layout and clunky features creates a poor user experience. That’s why we invest in UX and SEO research and build wireframes of customer journey flows – all before we design the visuals of a single page. Many companies are aware of the importance of responsive design, that is designing content that looks good on any device. For us and our clients, mobile design is an imperative. Mobile users simply love their smartphones. In fact, research shows mobile phones are strongly associated with feeling of expressions of happiness and productivity. That’s why we always recommend taking a mobile first approach to any website project. With over 60% of user traffic coming from mobile traffic, now is the time to revisit your mobile strategy. Remember, your website is a living breathing marketing tool, that needs constant care and feeding. Make sure you’ve set aside budget for updates, improvements and changes in search algorithms. It’s the norm to expect to overhaul your website every 3 to 5 years. 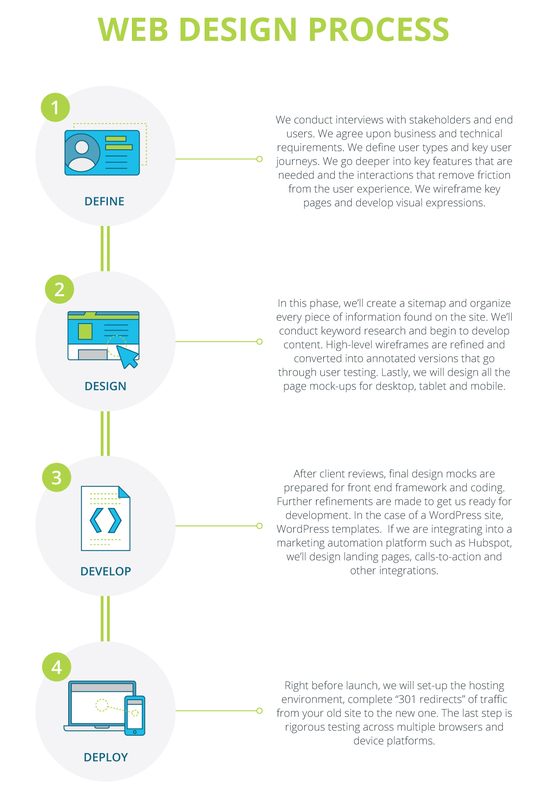 READY TO DEVELOP A WINNING WEBSITE?